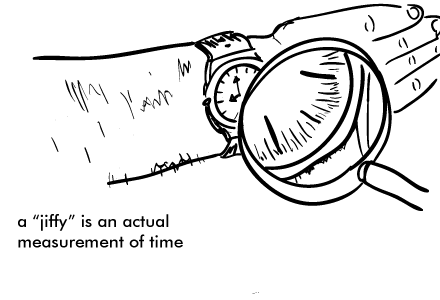 A 'jiffy' is an actual unit of time, but it means different things across various fields of study. The term "jiffy" is often used to describe a very short but unspecified period of time, for example: "I'll have it sorted out in a jiffy!" The exact origin of the word is unclear, but it was first attested in 1785. Gilbert Newton Lewis (1875–1946) proposed a unit of time called the "jiffy" which was equal to the time it takes light to travel one centimeter (approximately 33.3564 picoseconds). Since then, it has been redefined and used for different measurements in different fields of study. In electronics, a jiffy is the time between alternating current power cycles (1/60 or 1/50 of a second). In computing, a jiffy was originally the time between two ticks of the system timer interrupt. The term "jiffy" is sometimes used in computer animation as a method of defining playback rate, with the delay interval between individual frames specified in 1/100th-of-a-second (10 ms) jiffies. In astrophysics and quantum physics a jiffy (as defined by Edward R. Harrison) is, the time it takes for light to travel one fermi, which is approximately the size of a nucleon. One fermi is10-15 m, so a jiffy is about 3 × 10-24 seconds. Informally it has been defined as "one light-foot," which works out as approximately one nanosecond.